Draft: 2010, Tampa Bay Rays, 2nd rd. While with the Marlins (2013-2018) was hit by a pitch 93 times, a franchise career record...was an MiLB.com Organization All-Star in 2012 for the Ray and in 2013 for the Marlins...was a minor league All-Star in 2010 (New York-Penn League), 2011 (Midwest League) and 2012 (Florida State League...in 2011 was Bowling Green's Most Valuable Player and the Midwest League Player of the Week for 7/4-7/10 and 8/15-8/21. Attended St. Ignatius High School in Cleveland and Georgia Tech in Atlanta...was a semifinalist for USA Baseball's 2010 Golden Spikes Award...sister, Dawn, is a professional figure skater...his grandfather, Steve Demeter, played with Cleveland and Detroit over the 1959 and 1960 seasons. Established a career high with 32 multi-hit games...as a leadoff hitting ranked eighth in the National League in batting average (.277) and 10th in on-base percentage (.356)...batted leadoff in 55 apps after hitting first in just 32 career games prior to 2018...led Marlins leadoff batters in apps, at bats and hits...led the Marlins with a .290 batting average on the road, 20th-best in the National League...led the Marlins with 21 hit by pitches, tied for second-most in the Major Leagues...prior to the All-Star break produced 94 hits, a career high for the first half of the season...10 of his 16 home runs tied the game or put the Marlins ahead...on 11/20 was designated for assignment...on 2/19/19 was signed by the Reds to a minor league contract with an invitation to 2019 Major League spring training camp. In second full season at Major League level, set career highs in games played (135), at-bats (406), runs (56), hits (101), doubles (22), home runs (13), RBI (53), and walks (36)...Ranked fifth in NL and tied for sixth in MLB in hit-by-pitch (18)...Owned .236 average (78x331) vs. right-handed pitchers, and .307 mark (23x75) vs. left-handed pitchers...Appeared at first base (10 games/4 starts), second base (10 G/6 GS), third base (103 G/93 GS), and in left field (5 G/2 GS)...Among NL third basemen with at least 100 games played, his nine errors were tied for third-fewest behind Anthony Rendon (7) and Justin Turner (8) ...Was 5x14 (.357) with 12 RBI when batting with bases loaded...Set new career high with five RBI on July 26 at Texas...Had seven-game hitting streak from August 1-8 (.360/9x25); streak was one shy of tying career long done in 2016 (September 11-21)...Hit third career pinch-hit home run on Sept. 2 vs. Philadelphia; finished campaign with four hits in 17 at-bats (.235) in PH role...Hit .281 (16x57) with five home runs and 14 RBI in Sept., marking highest single-month home run total of career. The 14 RBI were tied for second-most in any month (also May 2016), behind 15 in August 2015...Posted .278 average (47x169) and .894 on-base plus slugging percentage with 10 doubles, two triples, nine home runs, 31 RBI over final 52 games. In first full season as Major League level, posted career highs in nearly every offensive category, including average (.279), hits (98), doubles (20), triples (5) and RBI (42)...Hit by pitch 24 times, marking Marlins' single-season Club record...Ranked second in Majors in HBP, behind Brandon Guyer (31)...Led Marlins and ranked third among qualifying National Leaguers with .350 (7x20) average as pinch-hitter. Recorded two doubles, triple and two home runs while driving in nine as PH...Recorded pinch-hits in first two games of season, April 5-6 vs. Detroit...On April 5, recorded second career pinch-hit RBI with a ninth- inning double. Other PH RBI was on April 21, 2014 at Atlanta, his first career pinch-hit (double)...Next night drove in another run with ninth-inning single...Connected for first career leadoff home run (off Chase Anderson) on first pitch of game on April 30 at Milwaukee. Was first Marlins' player to homer on game's first pitch since Cameron Maybin on August 27, 2010 vs. Atlanta. - STATS LLC...Tied career high with three hits on May 1 at Milwaukee. Equaled mark four more times over remainder of season...Drove in career-best four runs in 3x3 effort on May 29 at Atlanta. Was triple short of cycle...Hit .333 (32x96) with seven doubles, two triples, one home run and 14 RBI in 28 May contests...Hit second career leadoff home run on July 1 at Atlanta (off Julio Teheran)...Marked first career walk-off hit and RBI with run-scoring triple on July 31 vs. St. Louis. Was fourth triple of year, setting new career high...Hit by pitch for 52nd time in career on August 13 vs. White Sox, breaking tie with Alex Gonzalez for Club record...First career pinch-hit home run came September 16 at Philadelphia, a game-tying solo homer off Edubray Ramos...Followed with second of PH homer of career on Sept. 21 vs.Washington, a seventh-inning, two run shot off Max Scherzer...Hit in eight consecutive games from Sept. 11-21, marking career- long. Hit .588 (10x17) with two doubles, two home runs and seven RBI over streak. Opened sixth professional season at Triple-A New Orleans, but went on to post career bests in games (90), average (.256), at-bats (250), hits (64), runs (38), doubles (14), triples (3), home runs (10) and RBI (24) with Miami...In 56 games with Zephyrs, hit .260 (50x192) with 13 doubles, two triples, seven home runs and 27 RBI with an on-base percentage of .357...In first game of season, April 9 vs. Omaha, went 3x6 with a double and one RBI...Three hits set a season high he would tie two more times with NOLA: May 8 at Memphis and May 30 at Reno...In May 30 game at Reno, posted five RBI to tie a professional high: also did so on July 20, 2012 vs. Clearwater, May 21, 2012 vs. Brevard County and May 5, 2011 at Lake County...Recalled by Miami on June 12, leading Zephyrs in home runs (7) and extra base hits (22) at time of recall...Recorded two hits in first inning on June 16 vs. Yankees, becoming first Marlins player with two hits in one inning since August 20, 2012 at Arizona (4th inning; Carlos Lee, Jose Reyes and Donovan Solano)...Connected for two home runs in June 20 game at Cincinnati; fourth inning off Anthony DeSclafani and seventh inning off Manny Parra. Marked first career multi-HR game...Marked first career three-hit game on July 8 at Boston. Also had three-hit efforts on August 5 vs. Mets and Aug. 19 at Milwaukee...On July 31 vs. San Diego, hit two-out, game-tying home run in ninth inning off Craig Kimbrel, marking second career home run in ninth inning or later...Recorded two hits in ninth inning in first game of Aug. 5 doubleheader against Mets, becoming first player in Marlins history with multiple hits in ninth inning...Joined Benito Santiago (1993) as only two players with two hits in an inning twice in same season...Had 15 RBI in August, setting new career high for any month (previous, 11 in June 2013)...Appeared at first base (two games), second base (two games), third base (26 games), left field (46 games), designated hitter and pinch-hitter. Split campaign between Triple-A New Orleans and Miami, appearing in 21 games with Zephyrs and 49 games with Marlins...Began season as Marlins' Opening Day second baseman, batting .314 (11x35) with two doubles, three home runs and nine RBI over ?rst 12 games...In ?nal 37 games with Miami, hit just .203 (25x123) with four doubles, two triples, two home runs and eight RBI.• In April 16 game against Philadelphia, tied career high with three RBI in Miami's 6-3 loss...On April 21 at Atlanta, recorded RBI double in first career at-bat as pinch hitter...According to Elias, was ?rst Marlin with RBI extra-base hit in ?rst career PH at-bat since Jeremy Hermida on August 31, 2005 vs. St. Louis (grand slam in ?rst career plate appearance)...Recorded career-best six-game hitting streak from May 12-18, batting .304 (7x23) with two doubles, two home runs and three RBI...Scored three times in Marlins 14-5 win over Philadelphia on May 21, marking career-high in runs scored...Optioned to New Orleans on June 3 and in 13 games hit .340 (17x50) with one double, six home runs and 15 RBI. Recorded a home run in six of ?rst 10 games played with Zephyrs...Homered in consecutive games twice: June 7-8 & June 15 & 17...Hit in seven straight with New Orleans from June 10-17, batting .542 (13x24) with a double, three home runs and 11 RBI...Recalled by Miami on June 22 and played in eight games before landing on 15-day disabled list with a strained right wrist. At time of injury, was tied for second with 10 HBP. 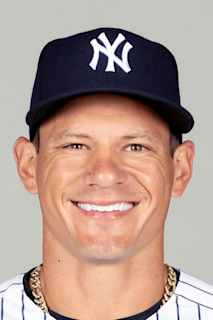 His 10 HBP were tied for fourth-most by a Marlin prior to All-Star Break (Aaron Boone-13 in 2007)...Recalled from rehab and optioned to New Orleans on August 26....In five rehab games with Single-A Jupiter, hit .313 (5x16) with one double, one triple, one home run and two RBI...Following season, played for Andy Barkett and Aquilas Cibaenas in Dominican Winter League. Hit .262 with four doubles, two triples and 11 RBI in 20 games. Split season between Double-A Jacksonville and Miami, earning promotion to Major League club on May 8. In 57 games with Marlins, hit .214 (46x215) with 10 doubles, two triples, nine home runs and 23 RBI. Ranked 12th among Major League rookies (eighth in NL) in home runs. Of his first five home runs, four tied game and one gave Marlins the lead. Was only 13th rookie since 1974 to tie game or give his team the lead with first five home runs, according to STATS LLC and SABR. Made Major League debut May 8 at San Diego (1x3). Singled off of Jason Marquis in first career at-bat. Recorded first career game-winning RBI on July 12 against Washington with an RBI single in first inning of an 8-3 win. Reached base safely in his first 14 career games, marking second-longest streak to begin a career in Club history, behind 17-game streak by Kevin Millar (April 11, 1998 to June 6, 1999). - STATS LLC. On the season, reached base safely in 45 of 57 games with Fish. In 28 games with Suns prior to having contract selected by Miami, posted .282 average (29x103) with seven doubles, two triples, four home runs and 16 RBI. Was sent back to Jacksonville on July 22; season ended on August 29 due to oblique injury. Batted .271 (59x218) in 63 games over his two stints with Suns, with 13 doubles, three triples, 11 home runs and 38 RBI. Earned 2012 Florida State League Midseason All-Star honors while with Single-A Charlotte. Named Single-A Bowling Green's Most Valuable Player and a Midwest League Midseason All-Star in 2011. Led Rays organization with 22 home runs and was fifth with 81 RBI. Ranked by Baseball America as Best Power Hitter in Rays' farm system entering 2012. Homered in five consecutive games from Aug. 14-19, batting 10x21 (.476) with eight RBI over stretch. March 28, 2019 Cincinnati Reds selected the contract of LF Derek Dietrich from Louisville Bats. February 19, 2019 Cincinnati Reds signed free agent LF Derek Dietrich to a minor league contract and invited him to spring training. February 19, 2019 LF Derek Dietrich assigned to Louisville Bats. November 27, 2018 LF Derek Dietrich elected free agency. November 20, 2018 Miami Marlins designated LF Derek Dietrich for assignment. September 3, 2016 Miami Marlins activated LF Derek Dietrich from the 15-day disabled list. August 27, 2016 Miami Marlins sent 2B Derek Dietrich on a rehab assignment to Jacksonville Suns. August 23, 2016 Miami Marlins placed 2B Derek Dietrich on the 15-day disabled list retroactive to August 19, 2016. Right knee contusion. June 12, 2015 Miami Marlins recalled 2B Derek Dietrich from New Orleans Zephyrs. March 18, 2015 Miami Marlins optioned 2B Derek Dietrich to New Orleans Zephyrs. November 12, 2014 2B Derek Dietrich assigned to Aguilas Cibaenas. September 29, 2014 Miami Marlins recalled Derek Dietrich from New Orleans Zephyrs. August 26, 2014 Miami Marlins optioned 2B Derek Dietrich to New Orleans Zephyrs. August 25, 2014 Miami Marlins sent 2B Derek Dietrich on a rehab assignment to New Orleans Zephyrs. August 16, 2014 Miami Marlins sent 2B Derek Dietrich on a rehab assignment to Jupiter Hammerheads. July 4, 2014 Derek Dietrich roster status changed by Miami Marlins. June 22, 2014 Miami Marlins recalled 2B Derek Dietrich from New Orleans Zephyrs. June 4, 2014 Miami Marlins optioned 2B Derek Dietrich to New Orleans Zephyrs. September 30, 2013 Miami Marlins recalled Derek Dietrich from Jacksonville Suns. September 6, 2013 Derek Dietrich roster status changed by Jacksonville Suns. July 23, 2013 Miami Marlins optioned 2B Derek Dietrich to Jacksonville Suns. May 8, 2013 Miami Marlins selected the contract of Derek Dietrich from Jacksonville Suns. December 4, 2012 SS Derek Dietrich roster status changed by Montgomery Biscuits. July 28, 2012 SS Derek Dietrich assigned to Montgomery Biscuits from Charlotte Stone Crabs. April 3, 2012 SS Derek Dietrich assigned to Tampa Bay Rays. April 1, 2012 Derek Dietrich assigned to Charlotte Stone Crabs from Bowling Green Hot Rods. April 4, 2011 Derek Dietrich assigned to Bowling Green Hot Rods from Hudson Valley Renegades. June 18, 2010 Derek Dietrich assigned to Hudson Valley Renegades from Tampa Bay Rays. June 17, 2010 Tampa Bay Rays signed 3B Derek Dietrich.